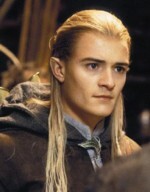 Orlando Bloom plays Legolas Greenleaf, an Elf who joins the Fellowship of the Ring. Orlando Jonathan Blanchard Bloom was born in Canterbury, England on January 13, 1977. He was raised there with his younger sister Samantha. They were always encouraged to get involved in the arts by their mother. At age 10, he decided to become an actor after watching “Superman.” Bloom had had some trouble with school because of his dyslexia, which lessened, but continued into adulthood. Orlando began reciting poetry and prose at fairs and at sixteen he dropped out of school and moved to London, performing with the National Youth Theatre for two seasons. He was awarded a scholarship to train with the British American Drama Academy, during which he won a small role on British Television’s “Wylde” in 1997. After this role, he was offered various movie offers, but he turned them all down. Next, he enrolled in the Guildhall School of Music and Drama, acting in Shakespeare’s “Twelfth Night,” Chekov’s “Three Sisters,” and Sophocles’ “Antigone.” Also while attending the Guildhall, he nearly became paralyzed in an accident in which he was attempting to make it to a friends roof top terrace when he fell, breaking his back. Surgery allowed him to walk out of the hospital on crutches. Two days before he was to graduate the Guildhall he was notified of his acceptance of his role as Legolas in Peter Jackson’s “Lord of the Rings” trilogy. Bloom had originally auditioned for the role of Faramir, but was called back and cast as Legolas. In order to play the warrior elf, he trained for two months before shooting in archery, swordplay, and horseback riding. He based his graceful, elfish style on Kurosawa’s “The Seven Samurai.” During shooting, Bloom preformed most of his own stunts, breaking a rib in the process. This set of movies would prove Orlando’s big break, going straight to the movie set of Black Hawk Down after the conclusion of the filming of “The Lord of the Rings.” There he played a neophyte ranger who breaks his back after falling from a helicopter 70 feet. His other future roles include playing Paris, brother to Hector and Helen of Troy in Wolfgang Peterson’s “TROY” with Brad Pitt and Eric Bana. Bloom included himself in the members of the cast that made up the fellowship in getting a tattoo of nine in Elvish, his on his forearm, adding it to the sun tattoo on his torso. His hobbies include surfing, skydiving, and photography. This brown haired and brown-eyed young actor has caught the attention of the world audience, becoming quite popular with all ages.